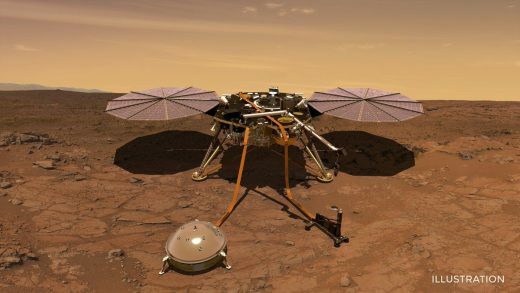 Now that the Insight lander has settled in on Mars, scientists are learning more about the spot it’s in. With its 7-foot-wide solar panels fully deployed, it has already set a record for the most energy generated in a single day by any lander or rover on Mars at 4,588 wH. Also, the protective covers are coming off of its cameras, which should enable higher-resolution images. Fortunately, while the lander is tilted at a 4-degree angle inside its impact crater, it’s designed to operate at up to a 15-degree tilt. Any more could have prevented the panels from opening, and they’re needed to generate enough energy during its two-year mission toperate all of the instruments, even as dust and dirt flying around on Mars starts to cover them.